"Woo! That's a bad outfit!" There was a discussion between The Ultimates back in their 4th issue of their original series in 2002 about who could play each member of the team. When it got around to the Nick Fury of the Earth-1610 Universe the answer was obvious because the Ultimate version design by Brian Hitch was based on Samuel L. Jackson. This seemed an appropriate choice for an updated version of Marvel's greatest spy. Jackson was cool and calm and also prone to cold-blooded violence in film roles before and when they made the initial Iron Man movie it was a no-brainer that he would take the role as a new take on Nicholas J. Fury. Fast forward to 2012 and the MCU is doing great. People are watching these movie consistently and Marvel Comics wants to reflect the characters on the big screen in their main line so they introduced two Army Rangers named Cheese and Marcus Johnson in a series called Battle Scars part of the Shattered Heroes event after the big Unworthy crossover series. 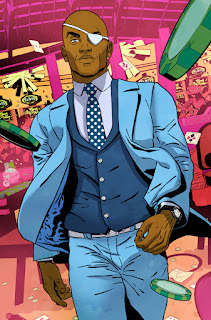 It's all a lot to get through but the point is the character of Cheese was revealed to be Phil Coulson and Marcus Johnson learned he was the African-American son of the original Nick Fury. He eventually joined SHIELD, adopted the name Nick Fury Jr. and lost an eye like his father. He also got a haircut to more resemble a younger and athletic Samuel Jackson. I honestly didn't care about Nick Fury Jr. Aside from a cool run that he had in the not so great Civil War II storyline (Choosing Sides issues), he just seemed like a ploy by Marvel Comics to align their books with their movies and TV shows and I didn't really need it. 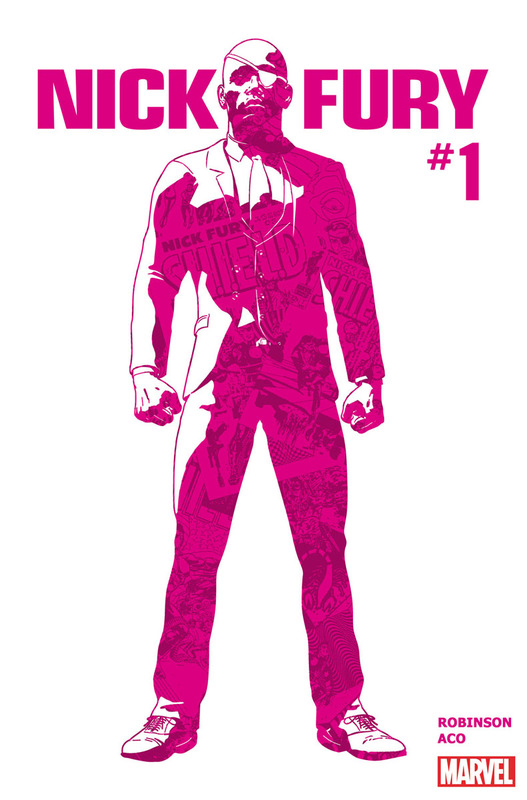 I liked old school Nick, not immensely but enough to respect the old Steranko vibe and Ultimate Universe Fury was good enough to be it's own thing in the 1610. I wasn't a huge spy guy and we had enough Nick Furys (Furies?) around and I didn't need another one to think about. I saw the first issue of this series and the same thought about Nick Fury rolled through my brain but I figured I would give it a shot. I had a feeling it would be short and I could just jump in and if I didn't like it, well, it wouldn't be too much of a waste of my time or money. The cover art was minimal and cool and James Robinson had wrote some Superman and Starman stuff I thought was okay. The big draw to me was the art by ACO who did an outstanding job illustrating the Midnighter series, a book about a character that I was actually interested in. If nothing else the combination of these two talents would be interesting. I read the first issue and I was in. The pacing of the issue was top-notched. It presented an interesting spy story in one issue and that is rare in comic books these days. I'm all for epic, dramatic, sweeping sagas in my comic book reading but sometimes it is nice to just pick up a self-contained story in a single issue. The story would contribute to a larger arc but if you just read it alone it is written well enough that you wouldn't be confused and you could enjoy the one issue. I enjoyed all six. I won't get into details because you should check it out. The series is basically a six issue run of six capers by Fury where he mainly foils Hydra plots in different locales. The different locations is what makes this series fun. The variety allows Nick to use his SHIELD technology in cool ways and shows how capable an agent he is. The dialogue is well-written, particularly the conversation and sit-reps between Nick and his SHIELD handler. Robinson has a handle on fast but coherent pacing that many try for but few actually achieve. And the art? Dude, the art. ACO makes crazy page layout choices that are reminiscent of the work of Sternako with this new millennium flair. Add to that the bright palette of color and color choices by Rachelle Rosenberg and you have something amazing. Check out this four page spread from issue 5. Yes, I said four pages. This team of creators have actually made me care about what this character is doing. He is no longer just a cash grab knockoff of a character from a different medium anymore in my head. Nick Fury Jr. is doing cool things on his own and I hope there is an opportunity for him to be cool again in another series. Nick Fury Jr. gets into a lot of bright and retro-feeling spy capers for six issues in his own solo series and I'm all for it.